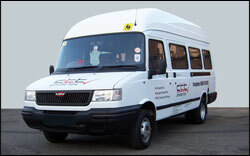 For Minibus vehicles with over 8 but under 16 passenger seats. All candidates who require this licence will require both parts of the Driver CPC (Modules 2 & 4) unless you are exempt. Limited, theory sessions supported by practical driving instruction and practice. The majority of driver training being practical in its nature and delivered in-cab on the public highways.Instruction is structured to give the candidate the widest range of experience and exposure to: varying traffic conditions, road types, urban/rural environments, vehicle handling and manoeuvring, gear selection etc.Duration: 5 days, 7 days, subject to outcomes identified at the initial Driving Aptitude Assessment.If you had entitlement to drive cars prior to 1 January 1997 – shown as group A (B for automatics) on an old style green or pink licence or as category B and D1 not for hire or reward on a pink and green or photocard licence – you can drive a minibus provided :You are 21 or over, the minibus has a maximum of 17 seats including the driver’s seat and is not being used for hire or reward.To drive a minibus which has 9 or more passenger seats for hire or reward you will normally need passenger carrying vehicle entitlement [PCV] (category D1 or D). To obtain this you must meet higher medical standards and take a further driving test. you drive on behalf of a non commercial body for social purposes but not for hire or reward, unless operating under a permit. the minibus maximum weight is not more than 3.5 tonnes excluding any specialist equipment for the carriage of disabled passengers. Minibuses up to 4.25 tonnes will be permitted in certain circumstances. if you are aged 70 and over, you are able to meet the health standards for driving a vehicle (i.e. minibus) which comes within the D1 class. Drivers aged 70 or over will need to make a special application which involves meeting higher medical standards. If you wish to carry fare paying passengers then you are required to pass an additional driving test in order to remove the “101″ licence restriction, you will also need to meet the higher medical standards and apply for your provisional licence, pass a PCV theory test and undertake the practical training and test. For more information on Minibuses and the law follow this link. Drivers who passed a car test on or after 1 January 1997 are required to pass an additional driving test in order to gain this category of licence, will not have this licence category, to apply you will need to meet the higher medical standards and apply for your provisional licence, pass a PCV theory test and undertake the practical training and test. For more information on Minibuses and the law follow this link. the vehicle is operated under a Public Service Vehicle (PSV) operator’s licence or permit. YOU CANNOT TAKE A PERMIT MINIBUS ABROAD IF IT IS USED FOR HIRE OR REWARD UNLESS YOU HOLD EITHER PCV D1 OR D ENTITLEMENT.